There are several factors that go into the cost of creating and maintaining a thick, weed-free, green lawn – but it’s all pretty straight forward. The prices you will see below show costs for ‘typical’ lawns. Prices may vary. This is intended to provide an approximate price for services. At Green Giant, most of our customers buy a lawn care package. Different lawn packages – or lawn care programs – provide different levels of service. It is less expensive to buy a lawn package than to buy all of the services in the package individually. Our highest level Lawn Care Package is our Green Lawn Premium package. (Click any of the links to see what’s included in the packages). The mid-level Package is our Green Lawn Plus package (our most popular package). Our third package is our Green Lawn Basic package. This package will give you a very nice lawn, it just doesn’t include some of the protections to your lawn that the other packages include. You may also ‘Build-Your-Own’ program if the programs above do not suit your needs. We will be happy to discuss your needs and help you create the program that is right for you. What’s The Size of Your Lawn? 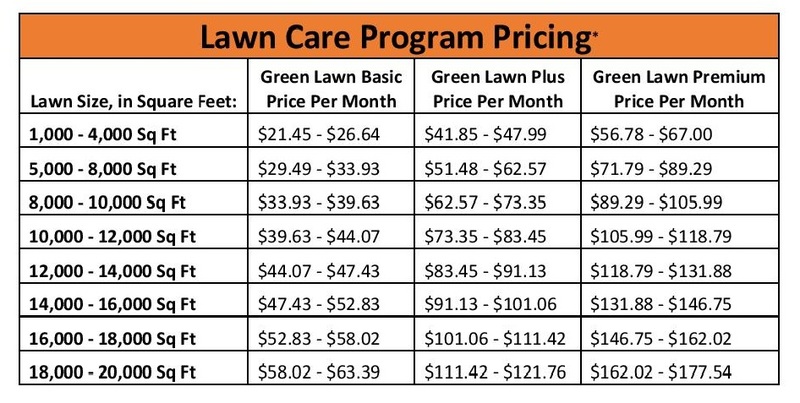 If you know the size of your lawn, you can see the pricing below. If you do not know the size of your lawn, you are welcome to contact us and we will get the measurement for you with our online measuring system – it’s no charge, no obligation and it’s fast. Or, you can measure it yourself – it doesn’t have to be exact to get a pretty good idea of what the cost will be. If you are considering our service, we can easily get an accurate measurement of your lawn areas. For pricing over 20,000, Sq. Ft., or any questions, please contact us.